Golden Tate was 10 months old when he took his first steps. It lasted a few hours before he started running. He's been chased ever since. "Everything was a race and a contest for him," his mother, Yolanda Tate, said by by phone this past week. The Eagles acquired Tate at the trade deadline to help bolster their offense for the playoff race. 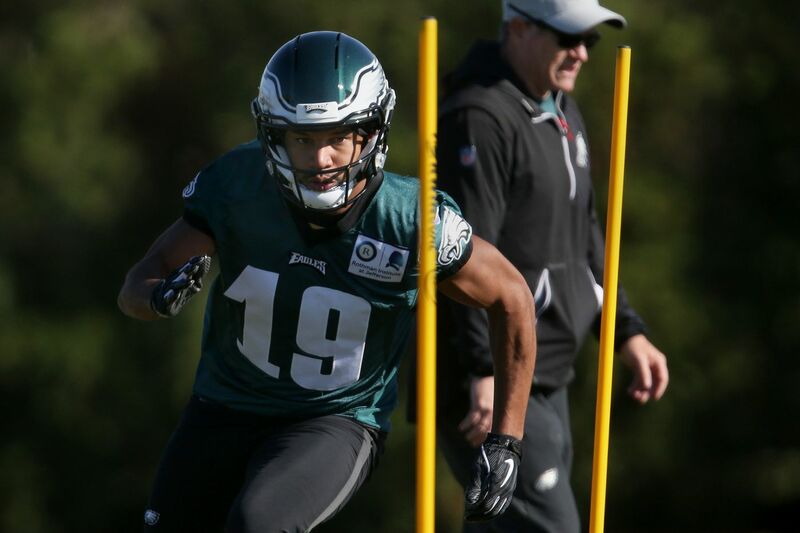 The Pro Bowl wide receiver will make his Eagles debut on Sunday against the Dallas Cowboys, and the Eagles won't take baby steps in introducing Tate. He's expected to play a big role, as the Eagles will try to utilize his run-after-catch ability often and in multiple ways. From a young age, Tate heard from his mother that "you can't hit what you can't catch." The expression resonated so much with Tate that he repeated it in three separate interviews since arriving in Philadelphia. And Yolanda Tate shared the same message when describing her son. "Even when they hit you, if they don't wrap you up, keep your feet moving," she told him. "Always keep your feet moving." That approach took Tate from Hendersonville, Tenn.; to all-American status at Notre Dame; to a second-round pick and Super Bowl champion with the Seattle Seahawks; to a high-priced free agent and Pro Bowler with the Detroit Lions; and now to Philadelphia, where the Eagles are hoping Tate keeps his feet moving for a few weeks beyond the eight games remaining on his contract. Although the 30-year-old could find a big contract elsewhere this offseason, his value will only increase if he can help spark life into an offense that has exceeded 23 points only twice this season. "I'd love to be here for as long as you all accept me," Tate said on his first day with the Eagles. "What I meant by at least the next eight games is I kind of plan on going to the playoffs and playing a few more. … Hopefully it all works out. I want to be here, and just know from day one, I'm all-in." Eagles new wide receiver Golden Tate holds a press conference at the NovaCare complex in Philadelphia, PA on October 31, 2018. From the moment Tate arrived in Philadelphia on a flight with fans coming back from London while sitting next to an IRS agent who informed him about Philadelphia's tax code, he's been given a crash course on the Eagles offense. Because he's a nine-year veteran with experience in different systems, the Eagles coaches thought Tate could quickly adapt to their offense. His first few days were spent with coaches because the players were on their bye, and wide receivers coach Gunter Brewer said Tate's aptitude was clear from their first meeting. Zach Ertz, who works out with Tate during the offseason, was on a text message chain lauding the trade. Different teammates reached out to help Tate with the transition, including Jordan Matthews, whose locker is now next to Tate's and who played at Vanderbilt with Tate's brother, Wesley. Carson Wentz invited Tate and his wife to church on Sunday; Tate's wife attended while Tate was at the team facility learning the offense. Tate applied what he learned when the players returned from their break on Monday. His first practice came Wednesday, which was when his teammates saw him on the field for the first time. Alshon Jeffery called Tate "our secret weapon" and the Eagles started to learn more about him than his game film revealed. "His ability to recognize and react to coverage," coach Doug Pederson said. "He's a smart guy, obviously. One of the things that you see on film with him is his first-step quickness, then when you see it in person, it shows up. We all know about the yards after catch. He's strong, former running back, things like that.And really a guy that comes in here and – sometimes you don't know about work ethic with different players, but being a veteran player, coming in here, embracing the offense, embracing his role this week, and what we're asking him to do, he's done a really nice job." In fact, Tate's role might expand beyond what the Eagles initially expected. After Darren Sproles aggravated his hamstring during practice Wednesday, the Eagles needed to find a new punt returner. Pederson didn't rule out Tate, who has 92 career punt returns. As long as Tate knows his offensive responsibilities, Pederson does not believe it's overloading him. After all, Tate is used to being chased. Tate's family touts his competitive nature, and Tate views it as a badge of honor. He's been racing since he was 10 months old – he was usually ahead – and the Eagles liked Tate not only for his production but also his personality. They believe his tough, competitive makeup fits with the locker room culture that helped them win a Super Bowl last season. "It's honestly how I'm built," Tate said Friday. "It's all I know. Growing up, I had older friends, we used to play whatever we could play. And there was always a score. I think I hate losing more than I like to win. I think it's always how I've been built. Being around my brother, my best friends, growing up, it's been instilled in me." Golden Tate during practice earlier this week. Yolanda Tate told her son from a young age what the value of an athletic or academic scholarship would do for his life, although Tate simply viewed it at the time as a chance to play football. His first word as a toddler was ball, and he gripped Nerf balls in his playpen. He also became a standout baseball player – he was drafted by the Arizona Diamondbacks out of high school, played at Notre Dame, and was drafted again by the San Francisco Giants while in college – but his future was in football. Tate topped 1,000 receiving yards as a sophomore for the Irish, when it started to become clear he would be a top NFL prospect. As a junior, he won the Biletnikoff Award as the nation's best receiver. His uncommon first name, a family moniker for which Tate was teased about as a child, suddenly became popular among football fans. "He was just a regular kid," his mother said. "He just tried harder, he studied harder, he practiced harder, and that's the difference in good and great." One of his assistant coaches at Notre Dame kept telling him to never be satisfied, and he tried to bring that mentality to the NFL. Yolanda Tate said her son is goal-oriented, often making a list of what he wants to achieve. He already won the Super Bowl and reached the Pro Bowl, so all-pro is the only accolade that alludes him. His mother said Tate is most competitive with himself – not those chasing him. "My No. 1 goal is to be a little bit better than the previous year – whether it's statistically, win, loss, whatever it is," Tate said. "That's kind of the only goal, then you don't have to worry about the decline." When Tate's not playing football, Wesley Tate said, his brother can be found on a golf course. Tate's grandfather was an avid golfer. Tate grew up watching Tiger Woods and Phil Mickelson, but he didn't want to play – he preferred a ball or a bat. At Notre Dame, he took a liking to a nine-hole course on campus. He used his grandfather's clubs and cleaned up a crosshanded swing. By the time he moved to Seattle, he was surrounded by nice golf courses. Good luck competing with him now; his handicap is 7.6. "I love it because it keeps that competitive edge," Tate said. "It's me vs. the course. And you can always be better." The biggest departure from competition has been fatherhood. He has a 9-month old daughter waiting for him when he returns home from work. Tate admitted football "used to be the most important thing in my life," and now his daughter has replaced that. His family is in Philadelphia for his Eagles debut this weekend. Rabid fans will be eager to see if Tate plays as advertised. The Eagles just need him to do what he's done since he was 10 months old.